A brand-new adventure series awaits you from Mad Head Games, the creators of Nevertales, Dark Realm, and Rite of Passage! Wanderlust: What Lies Beneath is rated 3.7 out of 5 by 15. Rated 5 out of 5 by ladynextdoor123 from So Much Fun I loved this game. The puzzles were challenging but not crazy difficult, the story line was great and the music and visuals were perfect. I couldn't stop playing and didn't want it to end. Rated 5 out of 5 by deddu from GREAT ADVENTURE If you like a lot of mini-puzzles this game is for you. They are varied and I thought fairly easy to understand. As an archaeologist you have a tool kit with a hatchet, brush and book to decipher the symbols that appear quite often. 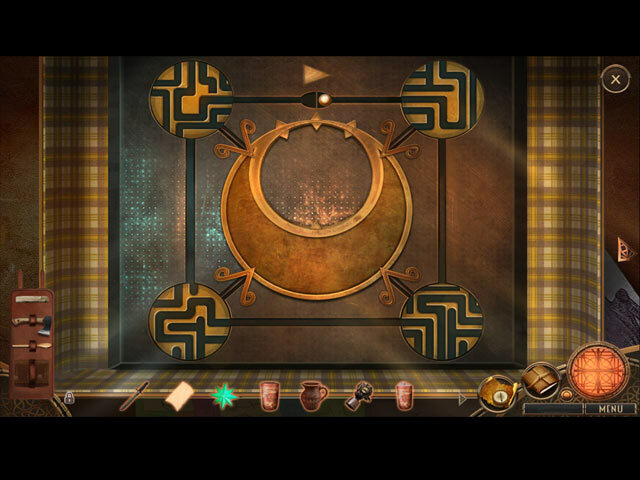 There are hidden objects to find, but the main emphasis is on the story and the puzzles. Rated 5 out of 5 by bcorsica from Wanderlust Good game, started pretty good til towards the end where we got showered with puzzles games and all, mostly, with these symbols... drove me crazy, too many of them and all alike and I ended skipping mostly of them cause I was fed up with it. As much as I like to be challenged, was not really a challenge to find 2 identical symbols. more actions and less of them would have been better. But a good game over all. Rated 5 out of 5 by DeadRiver from Fun Hidden Object Adventure Game Based on the Demo. Right from the very beginning, this game has beautiful visuals, the characters and locations are beautifully drawn. The graphics are so well done it is amazing. The soundtrack is excellent. The music and special effect sounds are great. The voices are easy to understand and appropriate for each character, from the fearless heroine to the whining sister. The puzzles and mini games are interesting and fun, except for a few I had to skip because they were so time consuming and in my opinion, very complicated. The instructions for the puzzle games were easy to understand and very clear as to what the objective was. The hidden object scenes were fun, fun, fun. I enjoyed each one. 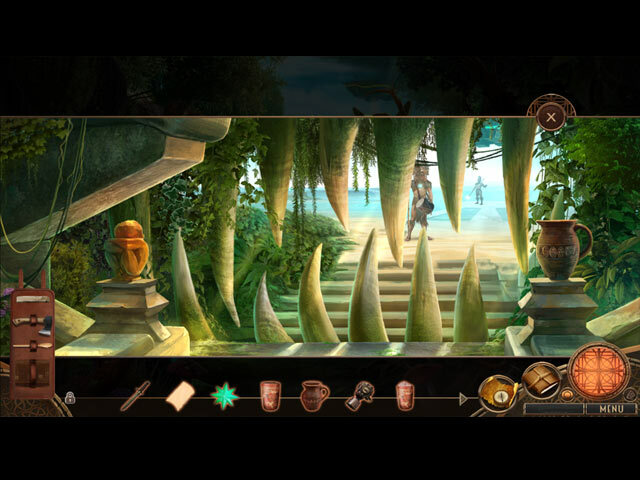 This is an amazing, adventurous game with plenty of hidden object scenes and mini-puzzles. The story line is interesting with the Demo ending in a real cliffhanger. It was an immediate buy for me. Rated 5 out of 5 by biscuitsmama from MAD HEAD SETS THE BAR HIGHER WITH AN EXCELLENT SCI-FI GAME Wanderlust What Lies Beneath is what I hope is only the beginning game in a new Sci-Fi series. You play the game as Professor Cassie Sylva currently working at a dig in Egypt when you receive a phone call from the mysterious Mr. Gate – one that might possibly change your life. Undiscovered pyramids don’t simply rise out of the earth do they? According to Mr. Gate, this is exactly what has happened in the Columbian jungle, and for you this is a mystery worth investigating. Of course, another team led by your sister Elsa is already on its way to the site so speed is of the essence. You soon find yourself on a plane to Columbia and a possible confrontation with Elsa. Find out more about sibling rivalry and the rift between Cassie and Elsa as you play this exciting new game from the genius development team at Mad Head. There is not a lot to say about the graphics but I will mention that they are crisp and color intense. After an earlier game this week that had very sub-par graphics it is terrific to find a game where I don’t need to strain my eyes to play a HOP. If I have any complaint at all it is with the game’s Custom Mode. I think that when the developers offer a Custom Mode they should allow the gamer to set their own Hint and Skip recharge times. A custom mode implies that the gamer can choose their preferred settings rather than have a time limit that is set by the designer. The game tools include an interactive map and a field kit that has a hatchet, brush, and a translation guide. I love everything about this game from the HOPS to the Puzzles. The HOPS are nothing new but they so very well-designed and varied in style. There is a Map/Maze HOP early in the game that is a combo HOP and Puzzle that I love. Even though there are a lot of puzzles they are not always difficult and they fit into the storyline. I’m not sure that I have ever played a HOPA game with as many puzzles as there are in What Lies Beneath but suffice it to say that it is a puzzle lover’s delight. Some of the puzzles are very easy but most of them have a moderate level of challenge. The CE version of the game includes finding the typical Mad Head logo that is hidden in each scene. There are Morphing Objects to be found in the HOP scenes and 20 Achievements that can be earned as you play the game. Other extras include the standard Wallpapers, Concept Art, Soundtrack, Bonus Game, and Strategy Guide. Other extras include a Character Gallery, an Ultimate Puzzle, and the option to Replay 18 HOPS. Sadly there is no Replay of the Puzzles unless they are somehow incorporated into the Ultimate Puzzle that can be opened after completing the Bonus Game. Wanderlust is one of the most terrific games I have played in a very long time and I hope that What Lies Beneath is only the first game in the series. I love Sci-fi and we get so very few games based on that theme so Wanderlust is exactly what I’ve been waiting to play. The storyline is excellent as we learn the back story of the family tragedy that separates the two siblings and the circumstance that will ultimately bring them together. 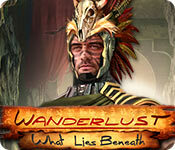 Even though Wanderlust is a perfect game for me, please try the demo to see if it is a game you will enjoy. Happy Gaming! Rated 4 out of 5 by Yanie1020 from Not Quite 5 Stars For Me Good game. Just not great. Lots of puzzles, which I really like, but they were all too easy. Never skipped and never really had to use my brain on them. But I do thank the developers for including a ton of them. I think you'll like this one. Rated 4 out of 5 by LikeAGoodStory from Something Different and Relaxing. I pay attention to storyline and how the tasks (puzzles, mini-games) work with it, and this one does. This is not a challenging game but the story engages the player, rather than just a few lines of dialogue here and there followed by lots of searching. It looks like the beginning of a series, and I hope it is. Also, this is a favorite developer of mine. Rated 4 out of 5 by wildlifecrusader from Adventure in the jungle This is really a nice game . I'm not quite through , but so far I enjoyed playing it. Art work, voice overs are well done and puzzles are really good . Everyone can set there level of challenge and this makes it a game for beginners and more experienced players. However, If you are not familiar with this type of games , you might consider going for the Collectors Edition. Try it , it is an enjoyable time killer. Rated 4 out of 5 by charlene_lane from DEFEAT N'EKTAH REVIEW FROM COMPLETED GAME AND BONUS This is a good adventure game with plenty to do. You play an archeologist, Professor Cassie Sylva who has to defeat N'ektah. There is: * Voiceovers (with dialogue); * Eureka, Dusted, Excavated, Unearthed and Discovery modes; * Interactive map; * Journal; * Gear bag. The graphics are superb and every scene is clear to see. Colours are muted and well defined. Sound is good and the music is orchestral and chanting. 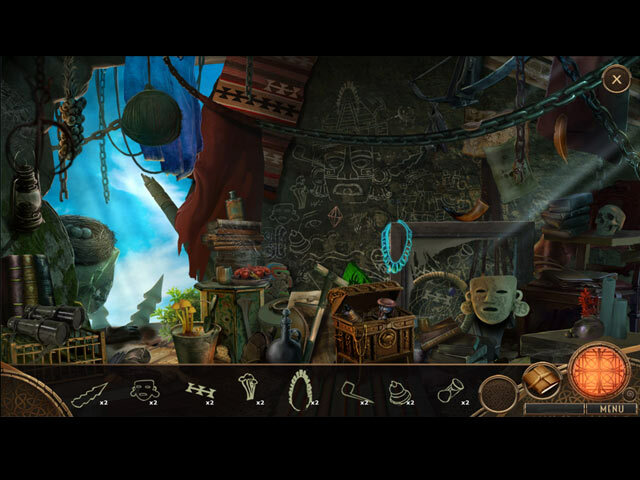 The hidden object games are mainly highly interactive straightforward and silhouette. Items are very clear to see and each one only takes a couple of minutes. Keep an eye out for that ever elusive morphing object. The mini-games are all very easy to do, however I enjoyed them. The instructions are clear and I'm sure you will find your favourite ones in there. You will have with you at all times a gear bag with an axe, glyph book, duster, shaman's crystal and a photo of your Dad. You will be using your gear bag a lot, especially to decipher symbols. This game has a phenominal amount of symbols, so I hope you like them. So, do you get the CE or SE? In the CE, the bonus is about helping a strage orb thing to go back into space, there are 30 swirls to find in the game and bonus and an ultimate puzzle and ultimate HOP (my favourite) which are always a great way to finish off the game. All up the game and bonus took me about 6 hours, so good value for money. Overall, I like the game and enjoyed playing Professor Sylva. Its definitely worth having a look at and putting into your collection. Happy playing fishies.